Turin sightseeing is varied and interesting. Make sure to stop in the city for a day or two when you travel in Italy. This site of the 2006 winter Olympics, located in northwestern Italy, is the capital of Italy's Piedmont region. It's a vital city of just under one million residents, filled with history, beautiful scenery, and some of the world's best food and wine. Turin has drawn some of the best minds in history. Among the city's famous residents have been the philosophers, Erasmus, Nietzsche, and Jean-Jacques Rousseau, writer, Umberto Eco, and Pierre Paul Caffarel, the inventor of chocolate. Perhaps best known outside of Italy as the home of the "Shroud of Turin," Turin has so much more to offer visitors. The Mole Antonelliana, named for its architect, is the symbol of Turin as well as that of the 2006 winter Olympics. This unusual, 167-meter tower is the tallest brickwork construction in Europe. Originally planned as a synagogue, the tower, begun in 1863, experienced many cost overruns and wasn't completed until 1873. The Jewish congregation had found other housing by that time and the structure became a monument to King Victor Emanuel II. Today, the Mole Antonelliana houses the National Cinema Museum, a comprehensive collection of film and film exhibits, with particular emphasis on early silent films. The most well known Turin sightseeing destination is the "Shroud of Turin", believed by many to be the cloth that covered Jesus after his death. 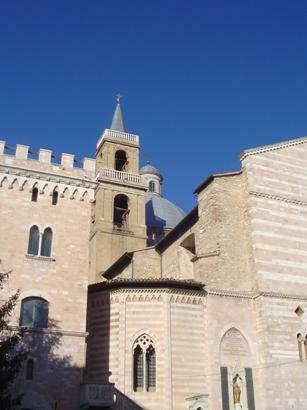 The Cathedral of St John (San Giovanni, in Italian) was completed in 1498, after seven years of construction. Within the Cathedral is the Chapel of the Shroud, which houses the Shroud of Turin. The 4.4 x 1.1 meter linen cloth is said to contain the likeness of a man. The cloth's authenticity has been questioned for centuries and even recent carbon dating has failed to solve the mystery. The Shroud was first depicted in art and literature in the mid-14th century and found its way to Turin in the 16th century, where it has remained. This important Egyptian museum is second only to the Cairo Museum in Egypt in number and quality of Egyptian artifacts. The Museo Egizio collection was established in 1824 when Italian King Carlos Felice purchased the extensive collection of French Consul to Egypt, Bernadino Drovetti. The collection was subsequently augmented by treasures found during Italian archeological expeditions in the early 20th century. The museum covers the period from 40,000 B.C. to 639 A.C. and highlights of the museum include the Royal Papyrus, which lists the Egyptian kings from 300 to 1600 B.C, the Tomb of Kha and Mirit, which is reassembled inside the museum, and various sarcophagi and mummies from the original Drovetti collection. The Botanical Gardens of Turin, located in the city's Valentino section, is a relaxing and romantic Turin sightseeing destination. The 550,000 square meter park, first opened in 1856, was originally the hunting lodge of the ruling Savoy family. Today, it features over 12,000 cultivated plant species as well as a 16th century castle and a medieval-style village, created for an 1884 general exposition. During the summer, the park comes alive with carnival rides, ice-cream vendors, live theater presentations, and an open-air cinema. Turin is well-known for its classic architecture. Of particular interest are the Savoy Residences. These 16th and 17th century palaces, scattered throughout Turin, were once the Savoy seat of government and are excellent examples of renaissance architecture. They were designated as UNESCO heritage sites in 1997. Also of architectural interest is Turin's town square, a medieval-style courtyard, ringed by the city's Town Hall and other government buildings. The city of Turin makes museum hopping easy with its Torino Card. For one price, visitors gain admission to 120 museums, sites, palaces, gardens, and attractions plus urban transportation to get there. It's a great value. Turin is a friendly, accessible city, and very welcoming to those on a Turin sightseeing tour.